I made this cake for my son's birthday. I baked a 6 in round and 10 inch square cake. Cover the square cake in light brown fondant. I used a ruler and small round pizza cutter looking wilton tool to indent the wood. I then took brown food coloring mixed with a very small amount of vodka to paint the lines and knots in the wood. When dry I used more brown coloring mixed with more vodka to make a very light translucent brown and painted over the whole cake with a thick brush to "stain" it a wood color. Cover the round cake in light blue fondant. I added grass on top with the grass tip and icing. 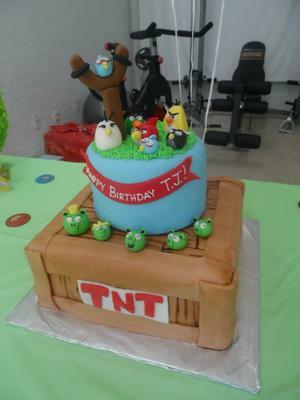 I hand sculpted all the birds and pigs as well as the slingshot from fondant and placed around cake. I would recommend to make these well in advance. I cut out the red TNT lettering with an xacto knife from fondant and added to a white fondant rectangle and put on the front. I also added a Happy Birthday banner from fondant. 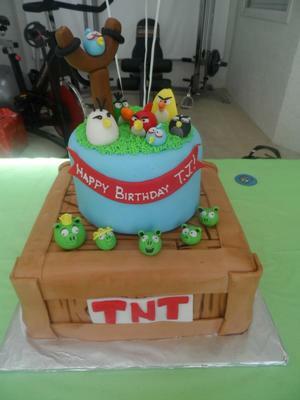 YOU'RE AS TACKY AS YOUR CAKE!